Whether you’re reuniting with family for a holiday or celebrating with your girlfriends, a tea party or brunch is always appropriate. Whether it be at an elegant restaurant or your own dining room, it is a great opportunity to wear your best outfits and accessories. If you’re the host you get to decide on the theme whether it be Mad Hatter, florals, a book series or a traditional high-tea. So let’s say that you’ve planned it all; the invitations, flower arrangements and tea selection. Now what will you wear? Being the Hostess with the Mostess is difficult, but, after arranging the flowers, tea and pastry selection you then get to decide on the perfect outfit. You could choose a simple, sleek maxi dress or one with a tulip skirt for your special occasion. I used to think that too many accessories got in the way and were too difficult to choose. That is the thing about accessories, they are a great addition even if it is one single wrap ring! For a special occasion, your accessories are a key addition! Hats, scarves, clutches, and of course Wrap Rings are a necessity. Mixing and matching your accessories or wrapping more than one ring is a great start. Try wearing your wrap ring as a midi or wrapped around more than one finger. These additions would be a great start to completing your tea party look. For a sleek and simple addition, add the Isabella in white. Or, if you need a pop of color, try the Elizabeth in blue and purple. If this was a bridal or baby shower, a Wrap Ring would be a great party favor or an accent to the table decorations. 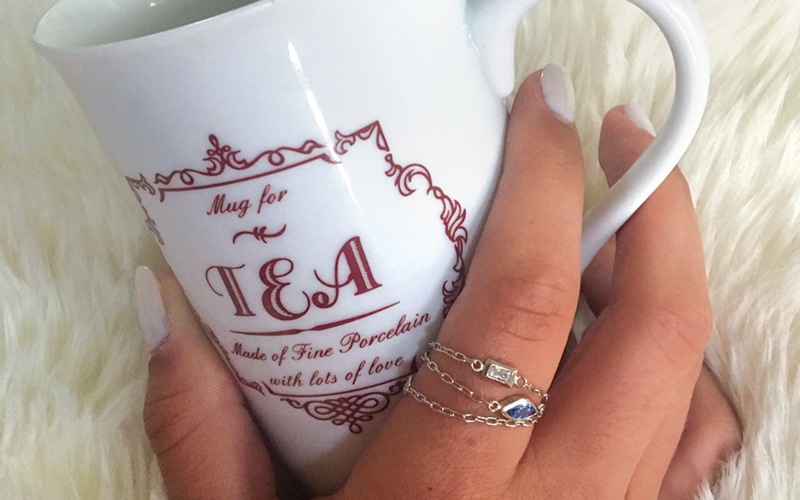 No matter if you choose to decorate you tea party or brunch with Alice and Wonderland themed accents or just focus on the best scones, puddings and English Breakfast tea, your Wrap Ring will be the talk of the tea party. And don't forget to subscribe to our newsletter! Have a picture of your Wrap Ring on Instagram that you want to show us? Put the share link in the field below for the chance to have it show up in the Gallery!